« Getting a 7D Mark II on Monday! George Lepp’s Comments on the 7D II. This Could Be You! My 2013 tax return was sent to the accountant yesterday. I have received two of the four DPP 4.0 RAW Conversion Guide manuscripts via e-mail and will begin the fifth and final edit this weekend. Then I will ship it off to Arash so that he can create the PDF. I took a day off from swimming yesterday. This blog post, the 306th in a row, took me about 2 1/2 hours to prepare. It was published at 5:32am from my home in Indian Lake Estates, FL. The Friday Afternoon October 10 BAA In-the-Field Workshop meet-up is now sold out. This image was created on the last San Diego IPT with the Gitzo 3532 LS carbon fiber tripod, the Mongoose M3.6 head, the Canon EF 600mm f/4L IS II USM lens and the Canon EOS-1D X. ISO 400. Evaluative metering +1 1/3 stops as framed: 1/1250 sec. at f/5.6 in Manual mode. 3 sensors up and 2 sensors to the left of the central Sensor/AI Servo-Surround/Rear Focus AF fell on the inside of the bird’s mouth below the bird’s left eye and was active at the moment of exposure but was not tracking accurately. See my additional comments below. Learn everything there is to know about the 1D X and 5D III AF systems including how to manage the various AF Area Selection Modes, when to use which one, and several ways to move the AF sensor around in the 1D X AF Guide and the 5D Mark III User’s Guide. Click here to see the latest version of the Rear Focus Tutorial. Click on the image to see a larger version. 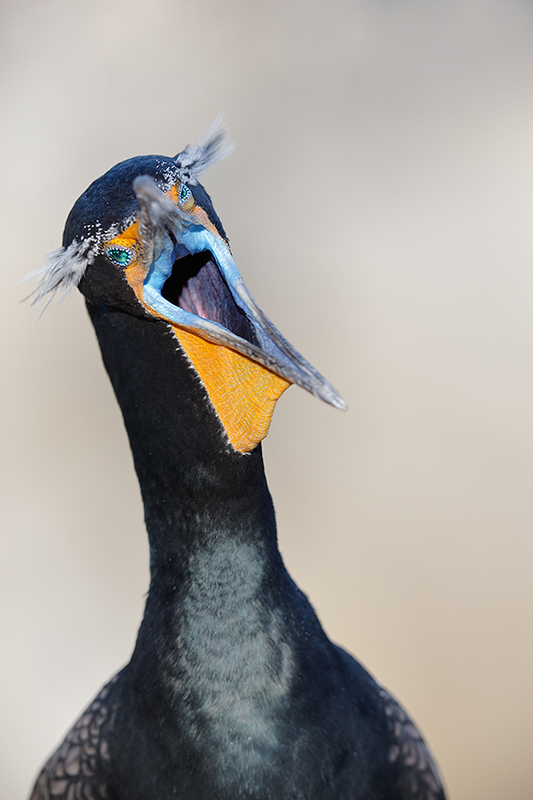 For the past few IPTs San Diego in January has offered some great opportunities to photograph both Double-crested and Brandt’s Cormorants in full breeding plumage. 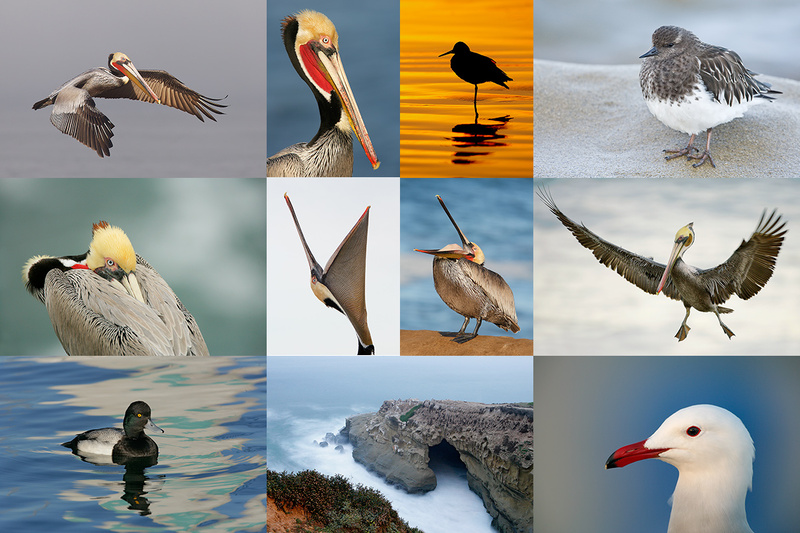 Not to mention the best Pacific race breeding plumage Brown Pelican photography on the planet. 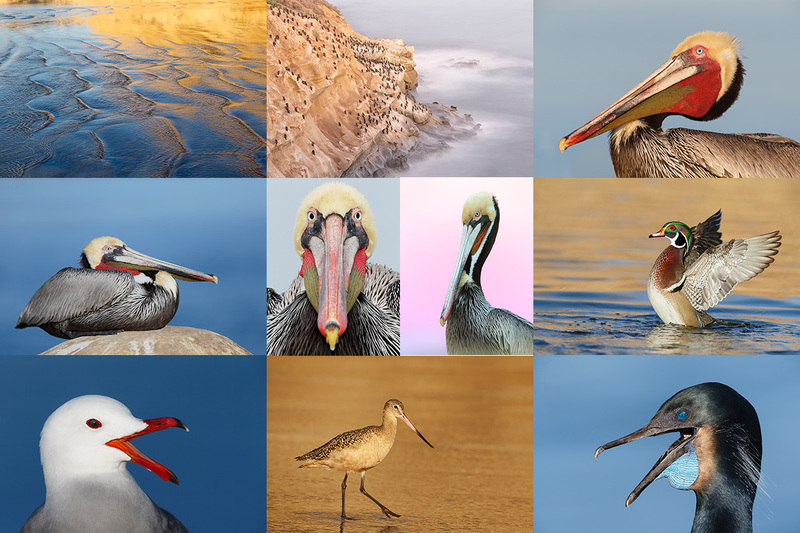 For lots more Brown Pelican images click on the blog posts before and after the noted post;you can find the before and after links just below the blog post titles. The link on the left takes you to the next post; the link on the right to the previous post. This is a crop of the BreezeBrowser screen capture. There are times when photographing action and flight, that you are pretty sure that the AF system will be severely challenged and will like fail to track accurately. Though this lesson has been extremely difficult for me to learn, I preach it often: when in doubt, press the shutter button! Why? At times the system might perform perfectly. At other times–as with today’s image–you may get lucky and be either pleasantly surprised or even amazed. 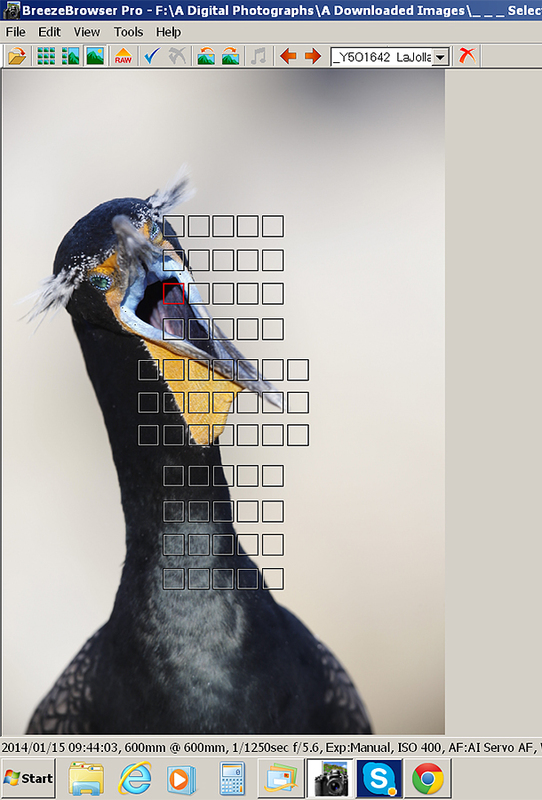 Examining the RAW file at 100% reveals that the sharpest focus was on the bird’s left eye rather than on the back of the throat, the spot below the active sensor. How does that happen? I was accurately focused on the bird’s right eye and the system was tracking smoothly and maintaining sharp focus. The bird suddenly lurched to its right and let out a yawn. Because of the speed of this motion and because of the lack of light and contrast in the back of the throat the AF system (fortunately) was not able to keep up and track properly. If it had, neither eye would have been sharp. With the bird’s left eye sharp and the right eye acceptably sharp a bit of Eye Doctor work on the latter (plus a bit of Quick Mask magic on the former) yielded a rather nice image. I finally practice what I have been preaching for two decades: when unexpected action occurs, push the shutter button! And BTW, this is 100 times truer with digital than it was with film as once you are dealing with a given situation the cost of pushing the shutter button is $0.00…. To reinforce this lesson, see the “Against All Odds” blog post here. After converting this image in DPP 4.0 I first opened the bird’s left eye a bit with a warped Quick Mask. Then I sharpened and lightened the face and eyes after making my selections with the Quick Selection Tool. Total time in Photoshop: six minutes. Clean-up and smoothing of the dark splotch in the upper right corner was done with a soft 40% opacity Clone Stamp Tool and the Patch Tool. As usual. Art, when do you think you will have your 7D mkII? Thanks as always. Monday or Tuesday via Fed Ex from George Leep :). Have to return it on the 12th. Arthur. I have rejiggered my camrea with back button focus and use blinkies. Wow what difference with shooting everything now! Glad you have preached and posted about these two techniques. Next, I will work on the focus pattern to be more on target with focus points. YAW. All good and glad to be of help. Please make it a habit to use our links :). Shana Tova and thanks for the information!